A quintessentially English rural song. It’s ubiquitous on the folk scene (to which it was introduced by Cyril Tawney and Tony Rose) but only ever collected twice in the tradition – once in Somerset and once in Devon. I believe I first heard this on an early 1980s LP by the group Salmontails. I don’t remember much about them, except they were a trio whose line-up featured Northumbrian pipes, and I’m pretty sure I once saw them at the Gypsy Davey folk club, which used to be held on a Friday night at the General Elliott in South Hinksey, Oxford. I can’t remember who lent me their LP, but I’d guess it must have been Caroline Jackson-Houlston. A little while later I heard the version on the Old Swan Band’s second LP, Old Swan Brand, and John Jones also used to sing the song at Oyster Band / Oyster Morris sessions. The first time I ever tried playing a concertina accompaniment would have been playing along in a session with John’s singing and melodeon. I won’t say I learned the song by osmosis, but when I decided to fix the words in my mind, most of them were already in there. As the 80s went by and John’s Oyster Band work meant that he was out with the morris less often, I would lead this in sessions. Normally with the irrepressible Mark Jopling providing bass harmonies. Indeed I remember that at the end of Sidmouth 1986, when the torchlight procession had wound down to the seafront, and the torches had been extinguished in the sea, Mark, Mary, Carol and I sang this on the beach before heading back to the camp site (where, I suspect, we sat in a small, cold Oyster Morris marquee, drinking whatever was left of the Shepherd Neame that had been brought down to keep us going for the week). I’ve only ever sung this in sessions, where people are joining in rather than listening, which probably explains the lack of finesse in my concertina accompaniment. I still sing it in G, although I’m not sure I can really hack it at that pitch any more. F would probably be better for me these days, but F is most definitely not a session key – so it’s one where I just have to gird up my loins, belt it out and hope for the best. I learned this song in the early 1980s from Caroline Jackson-Houlston, with whom I used to sing it. The song was collected by the Reverend Sabine Baring-Gould, from Sam Fone, a Dartmoor miner from Mary Tavy, Devon, in 1893. I always had it in my mind that Caroline had got the song from The English Folksinger by Sam Richards and Trish Stubbs, but actually the words we sang are not those given in the book, so I think perhaps Caroline had at least some of the verses from Baring-Gould’s Garland of Country Song (1895), where the opening line is “In the meadow one morning when pearly with dew”. Fone, on the other hand, appears to have sung “It was down in the meadows where violets are blue / I saw pretty Polly a-milking her cow”. ‘I would that the wars’ as sung by Sam Fone to Sabine Baring-Gould; from the EFDSS Full English archive. The reference to Flanders may indicate the Seven Years’ War or the campaign of 1793. John Wardroper reports that the legend, ‘Oh, I wish that the wars were all over’, appeared on popular prints in England in the early 1780s, during the American War, showing a ragged family amid a scene of ruin (Kings, Lords and Wicked Libellers, John Murray, 1973, p.85). Given the evidence of the song being sung in the 1770s, the Flanders Campaign of 1793 is too late, so the Seven Years’ War (1756–63) seems like a better bet. ‘I wish the wars were all over. A favourite song’ . Printed and sold by J Davenport, No. 6, Little Catherine- street, Strand, London, between 1799 and 1800. From Broadside Ballads Online. Actually, like the slightly later ‘The Banks of the Nile’, the sentiments expressed in the song are timeless. Unfortunately, the intervening 200-odd years give no cause for optimism in wishing that the wars will ever be over. For sportsmen, doctors, publicans and sinners. This rhyme, apparently dating back to the seventeenth century, relates to East Ilsley – formerly known also as Market Ilsley or Chipping Ilsley – a village which you’ll see signposted just off the A34 as you drive North towards Oxford from Newbury. The rhyme was quoted in a 1924 History of the County of Berkshire, where the authors append the comment “The village still maintains its reputation with regard to sportsmen and publicans”. Though the training of racehorses is still one of the principal occupations of the inhabitants, East Ilsley is chiefly noted for its sheep fair, which is one of the largest in England. Almeric de St. Amand, lord of the manor in the reigns of Henry III and Edward I, set up a market here on Tuesdays, which he claimed under a charter of Henry III. It was said to be injurious to the king’s market at Wallingford. (fn. 7) Sir Francis Moore in his digest of his title to the manor, compiled in the reign of James I, states ‘that the Tuesday market for corn was discontinued, but that a sheep market was held every Wednesday from Hocktide to St. James’ tide, and a yearly fair at the Feast of the Assumption.’ Sir Francis obtained a charter confirming his right to a market for corn and grain and all other merchandise, and ‘to take such toll as the Borough of Reading doth,’ also a grant of piccage and stallage and a court of pie-powder with all the fines, forfeitures and amerciaments thereof. Under the charter it was forbidden to have sales at Cuckhamsley, where they had previously been held, under pain of the king’s displeasure, the new site for the market being an inclosed square which has since been planted and is now known as the Warren. The markets are held by arrangement once or twice a month on Wednesdays from January to September. They increased rapidly until the middle of the 18th century, no less than 80,000 sheep being penned in one day and 55,000 sold, the yearly average amounting to 400,000.(fn. 8) In addition to the markets there are numerous fairs, the two largest being on 1 August and 26 August, while those at Easter, Whitsuntide, in September, October and at Hallowtide (on Wednesday after 12 November) draw dealers and graziers from all parts of the county. There is also a hiring fare in October. The wool fair has increased in importance and has been much encouraged by the annual presentation of two silver cups given by the Marquess of Downshire and other landowners to be competed for by the wool staplers and farmers. At one of the agricultural meetings formerly held at Ilsley the chairman wore a coat made from fleeces shorn in the morning, made into cloth at Newbury, and fashioned into a coat before the evening. ‘Parishes: East Ilsley’, in A History of the County of Berkshire: Volume 4, ed. William Page and P H Ditchfield (London, 1924), pp. 24-31 via British History Online. The last proper fair was held in 1934, but it was semi-revived as a village fete in 1975. A plaque in the centre of the village records this. Being famous for its sheep farming, it is not surprising that Berkshire was one of the many counties to have developed its own breed of sheep: the Berkshire Nott Wether. Sadly, it is now extinct, but the Hampshire Down is a direct descendant. There are some wonderfully evocative photos of a late nineteenth century sheep fair at Ilsley taken by the photographer Henry Taunt, which you can view on the English Heritage ViewFinder site. Sheep fair at East Ilsley, Berkshire – late 19th century photograph by Henry Taunt, from the English Heritage ViewFinder site. Group portrait at West Ilsley, Berkshire. A group portrait of the nine oldest inhabitants of the village, four men and five women, one in a wicker bathchair. Photographer: Henry Taunt. Date Taken: 1860 – 1922 From the English Heritage ViewFinder site. This song was collected by Cecil Sharp from Shadrack “Shepherd” Hayden (or Haden) at Bampton in Oxfordshire, on 6th September 1909. Shepherd Hayden had been born at Lyford, Berkshire in 1826, and he shepherded at Hatford near Faringdon before moving to Bampton in 1891. I don’t know if he ever did any shepherding on the Downs near Ilsley, but no doubt he met men who had, and learned this song (surely a local composition?) from one of them. Alfred Williams also noted down three verses of the song from Shepherd Hayden, under the title ‘On Compton Downs’, and noted “An old shepherd song, local to the Berkshire Downs between Wantage and Streatley, and one of the very few that were obviously written by rustics”. Actually the Roud Index shows that Hayden’s is not the only version to have been collected – there’s also one clearly related fragment (where the location is given as Marlborough) collected by George Gardiner in Hampshire. 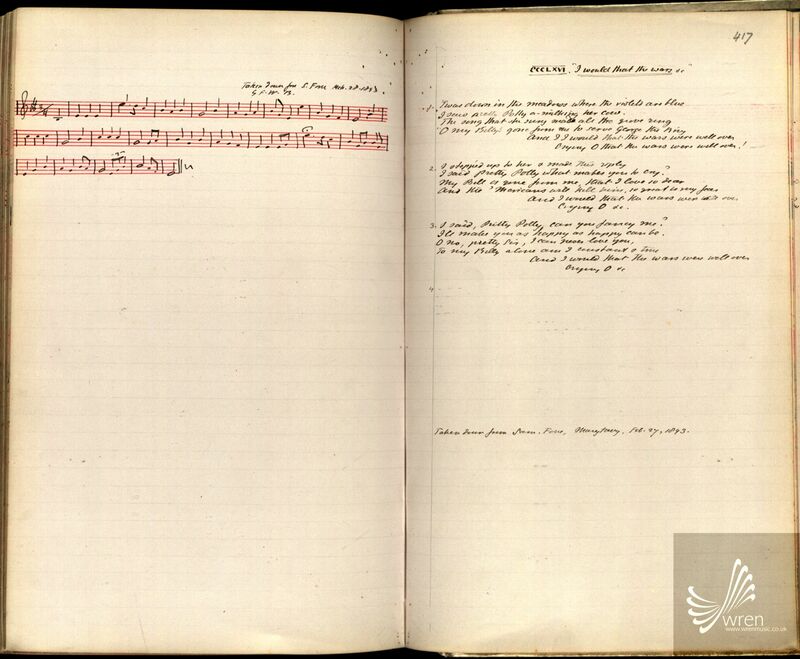 I learned the song from the copies of Sharp’s notebooks in the Vaughan Williams Memorial Library – now of course all available online – and we recorded it on the Magpie Lane CD Six for Gold in 2002. This is a live recording taken direct from the mixing desk at the Banbury Folk Festival in October 2007. Magpie Lane, recorded at the Banbury Folk Festival, October 14th 2007. A carol, so it’s often sung at Christmas. 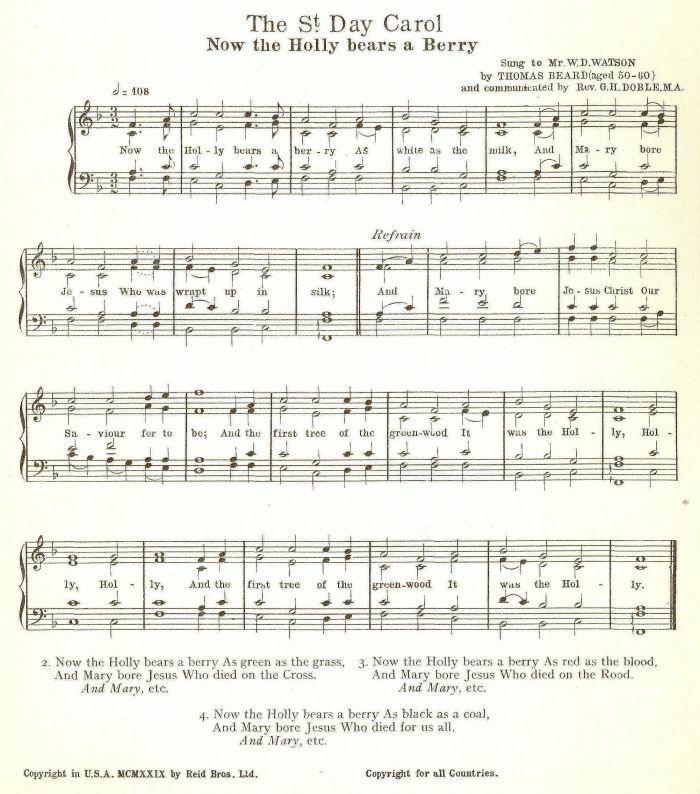 However with three of the four verses dealing with Christ’s death and resurrection, it’s surely more of an Easter carol – A.L.Lloyd, in his sleevenotes to the Watersons’ Frost and Fire describes it as “Another spring carol, proper to the period between Passiontide and Easter” and that’s good enough for me. I first heard the song on that 1965 Watersons LP; I probably learned it from there too, although I may have got the words from the Oxford Book of Carols, where it appears under the title of the ‘Sans Day Carol’. It’s also known as the ‘St. Day Carol’, having been taken down from an old man, Mr Thomas Beard, at St Day in the parish of Gwennap, in Cornwall. The Oxford Book of Carols tells us that “St. Day or St. They was a Breton saint whose cult was widely spread in Armorican Cornwall”.